direct to collectors at many specialist miniatures fairs in the UK. enabling you to order with confidence. undressed dolls and kits for you to dress. or polish to your own requirements. We also work together on special projects and commissions for customers. including the wonderful display at Leonardslee Gardens in West Sussex. (Sadly no longer open to the public.). 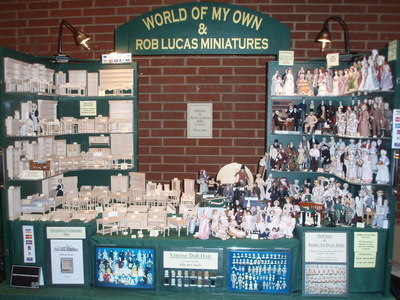 We attend a number of fairs including the Kensington Festivals and Miniatura. in the mid 1980s and attended our first dollshouse show in 1987.
highly detailed houses that Rob used to make. but will always accept a challenge. Below is a brief history in pictures.